The standard RadPane can be docked/floating, pinned/unpinned or grouped. Figure 1 shows the appearance of the RadPane in each one of these states. Docked: A RadPane which is docked to a RadDocking container. 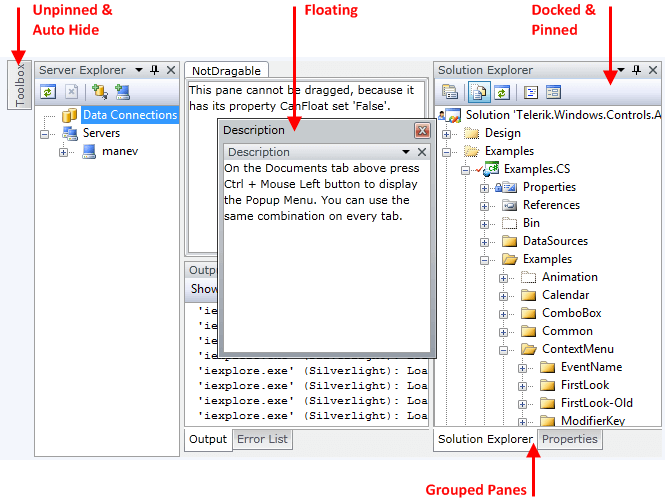 Floating: All RadPane instances which are not docked are floating and are hosted inside of a floatable ToolWindow that appears on top of other controls. Pinned: A pinned RadPane is always visible and does not hide automatically. Unpinned: An unpinned RadPane is shown only when the mouse cursor is over it and is hidden when the cursor leaves its area. Grouped Panes: When multiple RadPane instances are docked inside one and the same container, a separate tab is created for each one of them. To learn more take a look at the Pane Groups topic. RadDocking's PaneStateChanged event is fired when a pane changes its state. You can find more information in the RadDocking events article.